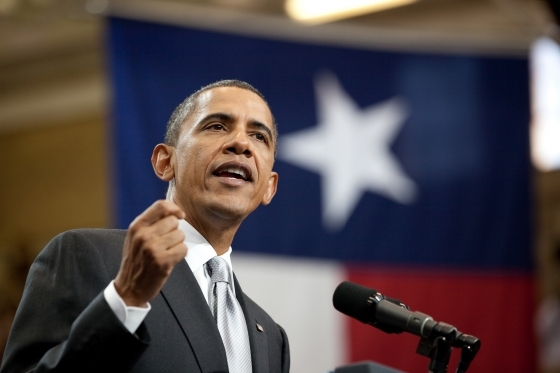 President Barack Obama visited Austin, Texas on Monday (click here to read the Austin American-Statesman story). Whether you are a Republican, Libertarian, Democrat, Tea Party member Independent or otherwise, a presidential visit is a big deal. Many friends and acquaintances of Re-find covered or were otherwise present for a variety of reasons during the President’s arrival at Austin-Bergstrom International Airport, the speech at the University of Texas and other stops on the trail. One friend mentioned that the arrival was very well-organized and that even the protesters were well-behaved — until the President whisked past the masses in his motorcade. The friend reports that obscene gestures were made at the President. It hurts to type those words. Flip off the President. Ever. Even if you don’t like his or her party, policies, personality or person. For the love of God, just don’t do it. Yell obscenities at the President. Even if you are protesting his or her party, policies, personality or person. You’ll likely get more attention for your cause if you are courteous, thoughtful, accurate and well-informed. Respect the office and maybe even the person. It is the understatement of all understatements to say that being President of the United States of American is not an easy job. To make progress in our society, further the causes we hold dear and create real, lasting and meaningful change, we must learn to speak calmly, learn to listen, refrain from name-calling, treat one another with respect — especially when we disagree — and, most importantly, overcome any and all urges to flip the President the bird. I so *very much* agree with these points, Melanie! Sometimes I think we (the electorate) are so used to witnessing reality-show-type behavior on REAL news channels where political events or protests are taking place, that we think it’s normal. It is not. I love your wise, final sentence Melanie. We in this society are very good at expressing ourselves, less so at listening; I’m happy you urge us to do more of the latter. Thanks for the kind words Tolly! Listening sometimes hard to do, especially when we get all worked up, but I’m convinced we can do it and come out better for it. Or at least I hope we can!